Standing at 23 meters high and weighing 18 tons, The Floralis Generica is a popular landmark in Buenos Aires and its image can be found all around the city. The sculpture resembles a flower and has six large petals made of stainless steel that extend towards the sky while a pool of water surrounded its base. The sculpture is located in the neighborhood of Recoleta in Plaza de las Naciones Unidas. The location is surrounded by acres of park, the law faculty of UBA, the Recoleta Cementery, and several restaurants and bars. 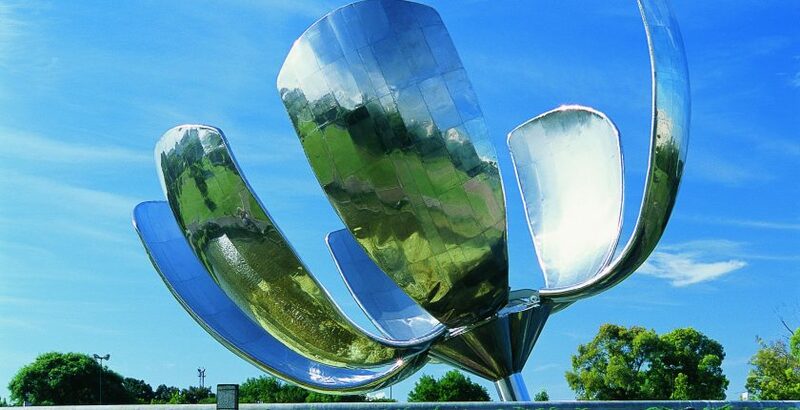 The sculpture was built in 2002 by Argentine architect Eduardo Catalano who described it as a “synthesis of all the flowers and, at the same time, a hope reborn every day at opening.” It is designed to open its petals at 8 in the morning and close back up at sunset. While closed, a glowing red light can be seen within the flower. This aspect of the sculpture makes it a unique tourist destination that Buenos Aires is very proud of. If you are looking for an evening activity that won’t cost you any money, head to Recoleta to watch the petals close while enjoying a run in the park or a glass of tinto at one of the surrounding restaurants.